Expanded testing requirements: Complying with the federal "No Child Left Behind Act" and the North Carolina "ABCs of Public Education" means tests, tests, and more tests. The result is a radical shift in the traditional rhythms of high school and big changes in what students are learning and how teachers are teaching. A worsening teacher shortage: North Carolina needs 10,000 new teachers annually to fill classroom vacancies, yet the state?s teaching colleges are only turning out 3,000 a year. At the same time, many new teachers burn out quickly, and veteran teachers are increasingly frustrated with the direction of public education, and wondering whether they?ll stay. Demographic change: NC has one of the fastest growing immigrant populations in the nation, meaning schools have to figure out ways to teach thousands of students whose first languages can be Spanish, Tagolog, Urdu or Arabic. Supporting those students, helping them learnEnglish, and making sure they pass standardized tests, is a challenge for high schools. A radically changed economy: The manufacturing and agriculture jobs that once fueled the North Carolina economy are fast disappearing, replaced by jobs that require more skills and higher education. Some educators say high schools must prepare all students for college. Others say high schools can?t forget students who might not be headed for higher education. A script for each radio piece, including a suggested host introduction, is attached with each piece. Please feel free to edit intros. 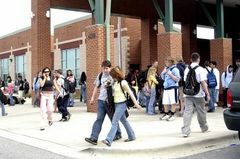 Five Promos for "Daily Lessons: Inside Western Guilford High School"
Part 4: What Are Kids Learning? Part 5: What Are You Going to Be When You Grow Up? Part 7: AP or Not AP?